Being an inexperienced driver increases your odds of an accident. This means that to ensure your safety, you have to pay even more attention than someone with years of driving experience. It can help to be mindful of new driver mistakes, and how to avoid them. Teenagers are less likely to wear seat belts than older drivers, which doesn’t make much sense when you consider the dangers of inexperienced driving. Always wear your seat belt, and make all of your passengers do the same, regardless of what your friends do when they drive. Skipping your seat belt is not only illegal, it could cost you your life. Research has shown that teenagers are twice as likely to make impulsive decisions as adults. This means that you might be more inclined to run a stop sign, skip your seat belt or drag race the driver that’s revving his engine at you at a red light. This natural impulsiveness is no excuse. It just means that when you have the urge to do something, you should take a second to consider whether or not it’s actually a good idea. Teenage life can take a lot out of you, especially if you’re involved with extra-curricular activities or trying to hold down a part-time job while in school. Tired driving is as dangerous as drunk driving, so if you find yourself feeling sleepy, pull over and call one of your parents for a ride. It’s always better to suffer a minor inconvenience than it is to risk your safety. When you pick out your first car, go for something with strong safety features. Older-model cars are often more affordable, but they don’t offer airbags or other safety features you will find on most newer cars. Your future is worth the additional cost. Whenever you drive your car, you are required to carry your driver’s license or permit, your insurance information and your registration card. You probably carry your license in your wallet or purse, but forgetting to put a renewed insurance or registration card into the vehicle is a common mistake. Getting caught without the proper information can result in a huge hassle, so make a point to keep a copy of your paperwork in your glove box. There are plenty of bullies on the road, from the drivers who get behind you and honk their horn to the friends who taunt you from the backseat about your “slow driving.” It’s up to you to ignore negative influences and focus on safety. 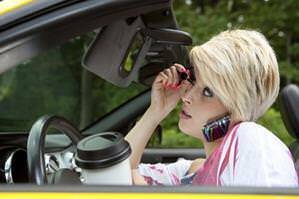 The possibility for distraction is one of the most dangerous factors involved with driving. Not only are there the sights and sounds of the outside world, but these days, there are cell phones, stereos and in-car DVD players to contend with. It isn’t always easy, but safe driving means focused driving. Statistics have shown that teens, when compared to adults, tend to leave less distance between themselves and the vehicle in front of them. This increases the potential for an accident if everyone ahead of you has to slam on their breaks in an emergency. Always leave plenty of space between you and other cars, as rear-ending someone can result in legal troubles for many years to come. It should be obvious that driving within the speed limit is your best option, but many teens still make the mistake of going much too fast. Sometimes they want to impress their friends, and sometimes, they just want to get where they are going as soon as possible. No matter what you have waiting for you, nothing is worth risking your life or the lives of other people on the road. This is another mistake that should be obvious, but sadly, it still happens each and every day. When it comes to teenage life, some partying is to be expected, but there is absolutely no excuse for getting behind the wheel while intoxicated. Ask yourself how you would feel if you were to injure or kill an innocent person. Some mistakes can’t be taken back, and if you only remember one tip from this list, let it be this one: Never drink and drive.